According to Emily Post, there are cherished traditions and wedding etiquette, but she never said anything about "rules." There are no real "rules" that need to be followed when planning your fabulous fete. Other than of course, making it legal. According to Emily Post, there are cherished traditions and wedding etiquette, but she never said anything about "rules." And we agree. Just like there is no "crying in baseball," (according to Tom Hanks) there are no real "rules" that need to be followed when planning your fabulous fete. Other than, of course, making it legal. We have noticed that many couples are getting too caught up in the old-fashioned traditions of planning a wedding when they should be setting trends of their own, and truly personalizing the guests' experience to reflect the their own individual style and personalities. After all, weddings have certainly evolved from what you would have seen in the 1950s where the ultimate dream of an affluent middle class bride was a cookie cutter production complete with white dress, white flowers and a white wedding cake (and a few other essentials) all for the bargain price of $3,000. As we go through the planning process with our couples we try to offer them creative ways to create their own wedding trends, while personalizing each aspect of their event. We remind them that, in today's event planning world, there are no rules. Instead, there are only traditions that couples should continue to try to put their own spin on, as well as etiquette guidelines to take into account during various aspects of the planning process, namely the invitations. However, we believe even these can be broken tastefully. So you are probably dying to know what rules we feel could be broken when planning your wedding. Well, here is our top 10 list of creative ideas to break wedding traditions. 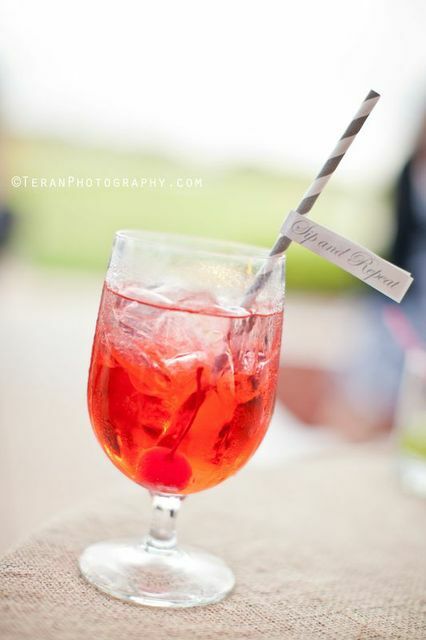 More and more we are noticing couples wanting to serve "pre-ceremony" cocktails at their ceremony. Well, why not kick off the day with cocktail hour first? Offer guests a time to mingle and get to know each other while they have a few drinks and hors d'oeuvres. Then, after the ceremony is over, you can go straight into dinner. This will allow you to have your ceremony later in the evening and can provide a gorgeous sunset backdrop for you to exchange vows. But remember, in order to pull this off properly, the you will need to see each other prior to the ceremony so you can get all of your pictures taken. Another rule breaking trend could be during your ceremony processional. So often, the bride is hidden for the big "reveal" and the groom is already at the front. 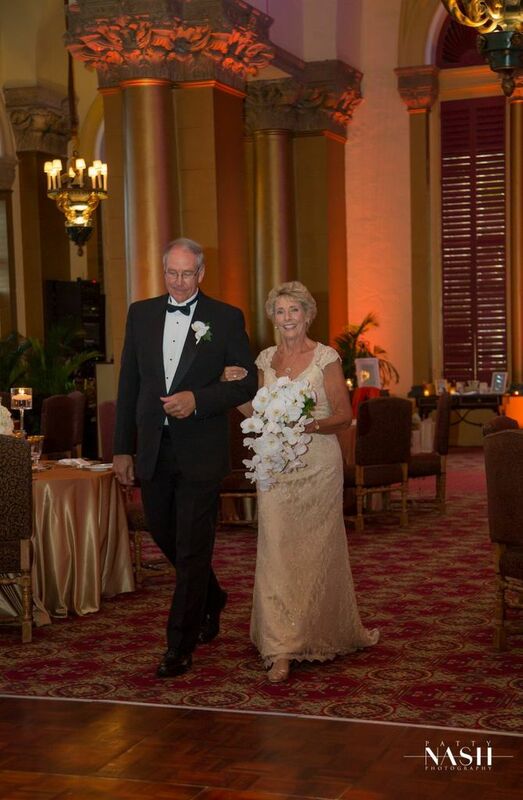 For a non-traditional couple that may not be so on board with the father "giving her away", why not cause a little drama for your guests, and walk in together, as bride and groom. After all, you are about to commit to each other for the rest of your life. How chivalrous and romantic to have your soon to be husband walk you down the aisle. This is especially great for older couples. Gasp! The tradition of wearing white dates back to the 1840s when Queen Victoria wed Prince Albert. She chose a white satin wedding gown for the day. Women in America and England decided to follow the trend and white soon became the go-to color for a brides' wedding dresses. Fast-forward 173 years and you see designers becoming privy to brides wanting something a little different. Blush seems to be the most popular color of choice for brides who do not want to wear white, but designers such as Vera Wang, Reem Acra and Ines Di Santo all showcased colored dress options for Spring 2013 in maroon, red, black and light blue. Even celebs, like Jessice Biehl for her wedding to Justin Timberlake, are going against the white dress trend. In the past, a bride would have never dreamed about playing games at her wedding. After all, this is a civilized celebration, not a frat party. Well, we think incorporating games for your guests can be a fun way to get them to interact as well as a way to entertain and break out of the mundane. Most recently, we planned a celebrity wedding for a client who insisted on having "beer pong." Although they had a formal affair, this offered some fun to their young guest list that didn't really want to dance. 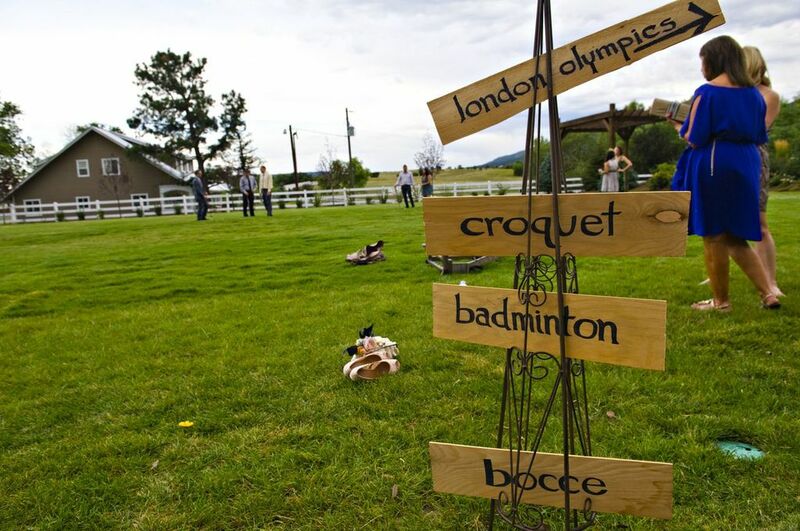 More and more couples are incorporating croquet, bocce ball, and corn hole into their cocktail hours and receptions. And guests seem to really love it. Nothing like a little friendly competition at your wedding. Eight chairs on the left, eight chairs on the right. 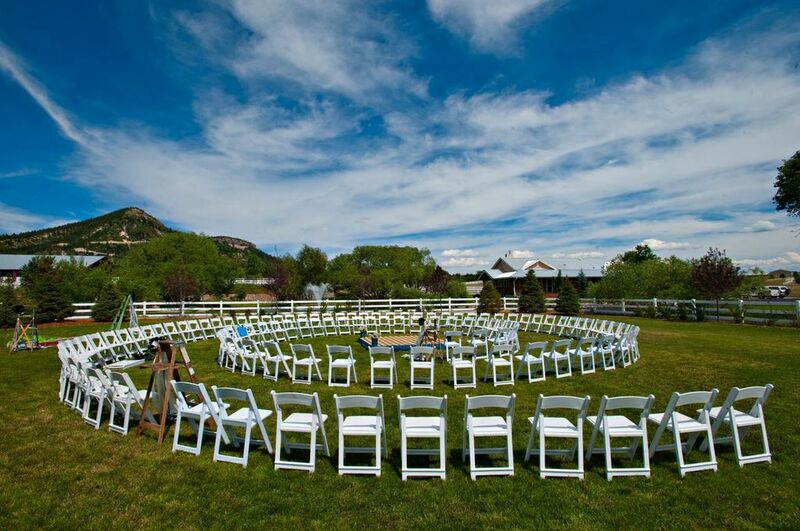 Although this seems to be what 95 percent of brides continue to do for their ceremony seating we feel that having some fun with your ceremony seating is another great way to buck this boring trend. We have seen ceremonies in the round, wooden church pews, mismatched chairs, hay bales covered in burlap, lounge furniture, and throw pillows in the sand. You can really get creative here. Think outside the chair! Couples can spend thousands on flowers and a big portion of your floral budget can be eaten up on $100+ bridesmaids bouquets and $30+ boutonnieres. For men, consider a pocket square or a creative boutonniere made from something other than flowers. We have seen everything from feathers to fly fishing gear. For women, let them carry a fabulous clutch (your gift to them) with small flower detail on it, or for an evening wedding, a charming lantern and candle to help the light way. Have some fun with this. Writing your own vows can be sweet and intimate, but why not have some fun with how you recite them to each other? They don't have to be typed on a piece of card stock or memorized; you can deliver them any way you wish. One of our creative couples read their vows to each other right off of their iPhones. Another couple read them off of a teeny piece of rolled up paper that slowly unwound into a pile on the floor. Let's face it. Are you and your new beaux to really going to sit down after the wedding and look through a book full of signatures? Clearly you know who attended your wedding, you were there! So, if you want to have your guests involved in some way, think of something more interactive here. For instance, for one client, we came up with the idea to display a map at their wedding and asked the guests to "Guess where the groom was taking the bride on their honeymoon?" as it was a surprise to the bride. The guests had a blast placing their bets. 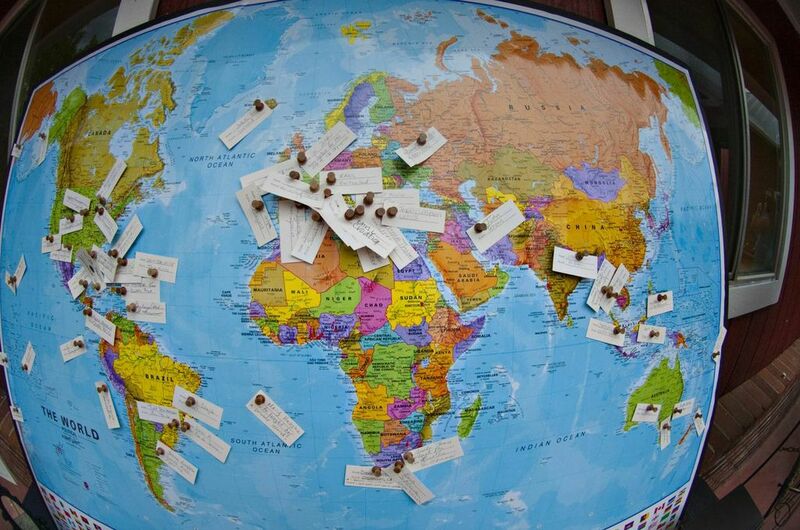 From Brazil to Boston, their names and pins were literally all over the map. The best part... whoever guessed correctly received a souvenir from the location. Now you probably think we are crazy, but think about it. Many couples can't take a honeymoon after the wedding due to work schedules or the season of the year. But if you took one "before" the wedding, you could actually get married while you are there, then come home and throw a fabulous party. One of our couples took their $50,000 wedding budget, split in half, and planned a $25,000, two week jaunt to Bora Bora where they were married on a Tahitian island. They then spent a week in Hawaii before coming home. One month later after they were legally married on their "honeymoon", they threw a fabulous party with the rest of the budget. The bride wore her wedding dress, and the groom his wedding suit. They were able to show pictures and videos to their guests all throughout the evening and truly enjoy themselves with their Tahitian tans. 10. Have fun with the "First Look"
One tradition that couples seem to be breaking more and more is seeing each other before the wedding. Not only can this take a lot of pressure off of each other before the wedding ceremony and allow for great "before" photos, but you can also have a lot of fun with it. 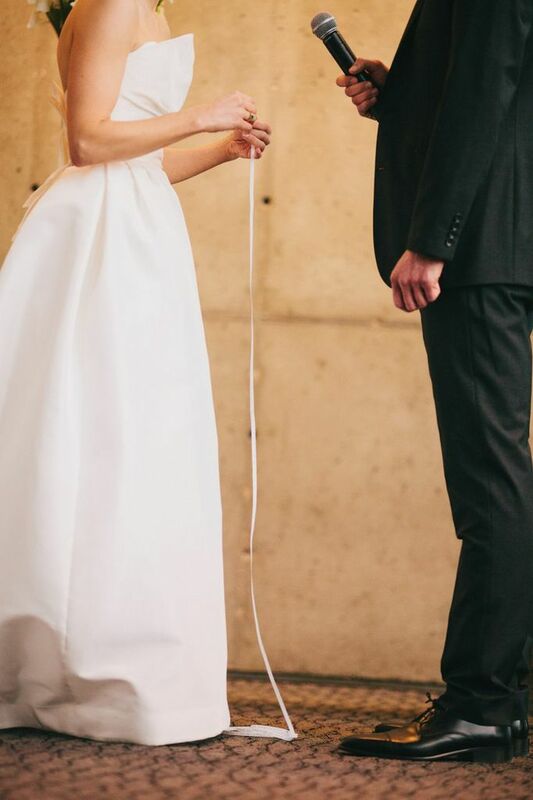 Think blindfolding the groom or hiding behind a ton of balloons before you each take a peek. Even if you don't want to see each other before the wedding, you could still do a "first look" with your bridesmaids or even the other men in your life like your father and brother.